Background: Children presenting with typical clinical features of celiac disease (CD) are diagnosed relatively easily, however, diagnosis remains challenging and is often delayed when they present with 'difficult to treat anemia' without overt gastrointestinal manifestations. Index study was undertaken to report profile of patients referred to pediatric hematology unit with 'difficult anemia' who subsequently were diagnosed with CD. Materials and Methods: The records of 83 patients (1988-2008) with CD were scrutinized retrospectively who had presented with predominant hematological manifestations. Results: CD was confirmed histologically in 31 (37%), while 52 (63%) were diagnosed by serology alone. The mean age at diagnosis was 8.0 ± 2.8 years. The mean duration of symptom-diagnosis interval was 40.9 ± 30.6 months. Eighty-one (98%) children had anemia (Hb < 11 g/dl) and 55 (66%) had received iron supplements without discernible benefit. Thirty-nine (47%) patients received a blood transfusion. Thirty-six (43%) patients did not have diarrhea. Majority of the patients had either a microcytic-hypochromic (48%) or dimorphic (43%) anemia. Twenty-four (33%) had thrombocytosis, while 5 (7%) had thrombocytopenia. Mean duration of follow-up for patients on roll in the clinic for more than six months was 17.7 ± 20.9 months. Conclusion: Pediatricians and hematologists need to be aware of the extra-intestinal manifestations of CD. Prolonged duration of symptoms and a diagnosis at a relatively older age is striking in children presenting with predominantly hematological manifestations. Investigations for CD are recommended in children presenting with iron deficiency anemia refractory to hematinics or who have coexisting growth retardation. Necessity for biopsy in overtly symptomatic cases is discussed. Children aged below 14 years with an established diagnosis of CD were included in this single-institution, retrospective study. Case files dating from 1988 to 2008 were retrieved from the records of the pediatric hematology clinic. Data pertaining to clinical and hematological profile, diagnosis and follow-up was extracted and recorded. Weight and height measurements at diagnosis and follow-up were noted. Diagnosis of CD was made in a suggestive clinical background with (i) endoscopic guided small bowel biopsy and serology or (ii) serology alone. Children were initiated on an austere gluten free diet (GFD) following the diagnosis of CD. Iron, folic acid, and vitamin B-12 were administered orally in therapeutic doses for the initial six to nine months. Family was provided with a diet chart that included a list of safe/unsafe food items. Children were followed in the hematology clinic at 1-3 monthly intervals for the initial 6 months, and at 6-12 months, subsequently. Blood counts were performed in the follow-up visits till normalization or as clinically indicated. Compliance for GFD was reinforced at each visit. Serum biochemical studies for iron, folic acid, or vitamin B-12 were not performed due to non-availability. Repeat serology or small bowel biopsies following GFD were not attempted. Wasting and stunting were defined as weight and height less than 80% and 90% of expected for age, respectively. Statistical analysis was performed using the Statistical Package for Social Sciences (SPSS), v10.0. Student's t-test was utilized for comparison of continuous variable data. Proportions were compared by Chi-square test and the Fisher's exact test. Eighty-three children with CD were identified over the 21-year period. Fifty-two (63%) were males (male: female ratio: 1.7:1). The mean age at diagnosis was 8.0 ± 2.8 years (range: 1.8-14). The majority, i.e., 28 (34%) and 26 (31%) patients were in the age group of 9-12 and 6-9 years, respectively. Merely two (2.4%) were below three years. The mean duration of symptom-diagnosis interval was 40.9 ± 30.6 months (range: 15 days to 11 years). The large majority of patients hailed from the north Indian states of Punjab (36%), Haryana (32%), or Chandigarh (14%). Weight and heights at diagnosis and follow-up are outlined in [Table 1]. At diagnosis, 63 (76%) and 34 (41%) children were wasted and stunted, respectively. At one-year follow-up, 61 children were available for evaluation; 38 (62.3%) were still wasted (P=0.51). Fifty-seven patients were available for follow-up at two-years; of these, 17 (30%) were stunted (P=0.86). The mean expected weight for age increased from 67.9 ± 16.8% to 77.5 ± 15.4% at one-year follow-up. The corresponding figures for mean expected height for age at diagnosis and at two years of follow up were 90.2 ± 8.2% and 94.11 ± 6.46%, respectively. Signs and symptoms are illustrated in [Table 2]. Sixty (72%) patients reported pallor. The symptoms of diarrhea and abdominal distention were significantly more common below the age of five years as compared to older children, the P values being 0.023 and 0.033, respectively. There was no significant gender difference in the symptoms. All children except two reported more than one symptom. An overwhelming majority of patients, i.e., 81 (98%) had anemia (Hb < 11 gm/dl). Fifty-five (66%) had received iron supplements without discernible benefit. Thirty-nine (47%) patients had received a red cell transfusion. Of these, 24 (62%) had received the transfusion prior to referral and the remaining were transfused at admission to our hospital. While majority (98%) of the patients had anemia at the time of diagnosis, merely 4 (13%) had Hb < 11 g/dl at one-year of follow-up (P<0.0001) [Table 3]. Furthermore, while 57 (69%) patients had severe anemia (Hb < 8 g/dl) at diagnosis, no child was severely anemic after one-year (P<0.0001). The mean Hb increased from 7.06 ± 2.3 g/dl at diagnosis, to 12.9 ± 1.2 g/dl at the last follow-up visit in children who were in follow-up for more than one year (P<0.001). No gender difference was observed in the mean Hb values. No difference was observed in the mean Hb or the rise in Hb amongst children less than or older than five years. Majority of the patients had either a microcytic hypochromic (48%) or dimorphic (43%) red cell morphology on peripheral smear. Normocytic normochromic and predominantly macrocytic morphology was observed in four (5%) and three (3.6%) patients, respectively. Platelet count was not available from the records of 10 patients. In the remaining, the mean platelet count was 392 ± 179 × 109 /L. Twenty-nine (40%) patients had an abnormal platelet count; 5 (7%) had thrombocytopenia (platelet count <150 × 109 /L), while 24 (33%) had thrombocytosis (platelet count > 450 × 109 /L). Eight (11%) patients had a platelet count exceeding 600 × 109 /L. Six (8%) patients had a leukocyte count below 4.0 x 10 9 cells/L; two of these had neutropenia (ANC <1500 × 106 cells/L). Diagnosis was established by serodiagnosis with or without a duodenal biopsy [Table 4]. CD was confirmed histologically in 31 (37%) patients, while a positive tissue transglutaminase antibody (tTG) alone was the modality of diagnosis in 52 (63%). Coexisting medical conditions were observed in four patients. Two each had pulmonary hemosiderosis and IgA deficiency. In the patients with pulmonary hemosiderosis, recurrent anemia was secondary to pulmonary hemorrhage; investigations for secondary causes unearthed CD. The patients with IgA deficiency had classical symptomatology of CD. IgA based serology was negative. Due to high index of suspicion, IgG based serology and duodenal biopsy was requested which confirmed the diagnosis. Mean duration of follow-up for patients on roll in the clinic for more than six months was 17.7 ± 20.9 months, while the longest being 83 months. Thirteen (16%) patients did not revisit following diagnosis. Nine (11%) patients had duration of follow of less than one year at the time of compiling data. Index series is one of the largest compilations of children referred to pediatric hematology services with hematological abnormalities and subsequently diagnosed to have CD. Though gastrointestinal (GI) complaints were frequent, they were subjectively less annoying. The foremost symptoms were related to anemia. Regional distribution of patients in the study represents the predominantly wheat-consuming north Indian population. The guidelines for diagnosis of CD are given by the European Society of Pediatric Gastroenterology and Nutrition. Histological confirmation is mandatory and remains the gold standard of diagnosis. We have swayed from the standard guidelines, as the diagnosis was made in a large majority by serology alone. Biopsy was performed in 31 cases; the findings were not in conflict with the diagnosis of CD in any of the symptomatic, sero-positive cases. This gave us confidence in initiating GFD in symptomatic cases following a positive tTG. With the advent of highly sensitive and specific serological tests, there is increasing discussion on avoiding duodenal biopsy in selected, overtly symptomatic, serology positive cases. This is particularly true in tropical countries where histological changes consistent with CD may not be pathognomonic of the disease. Several conditions lead to villous atrophy, indistinguishable from CD. These include 1) persistent enteric infections; 2) parasitic infestation with Giardia lamblia; 3) small bowel bacterial overgrowth or tropical sprue; and 4) severe malnutrition and rotavirus enteritis. , A biopsy may in fact be misleading in such cases. In popular flow-charts for the diagnosis of CD, cases with a clinical probability of CD and a positive serology are shown to have a 'dead-end' option of a positive biopsy. It is known that in patients with symptomatic CD, the presence of circulating antiendomysial antibodies or anti-tTG antibodies is highly predictive (97%-100%) of biopsy changes of CD. Need for intestinal biopsy in every case has been questioned by Scoglio et al. though their conclusions were criticized as being flawed. Murdock et al., have raised the issue of diagnostic criteria for CD as well. It has been suggested that a biopsy may not be required in symptomatic children with a high titer of tTGA. ,, Some experts, however, maintain that a biopsy is essential for establishing a 'cast iron' diagnosis at the outset. Needless to say, the biopsy remains indispensable for majority of the asymptomatic sero-positive cases detected during screening or in symptomatic sero-negative individuals. Hematological manifestations of CD are increasingly being recognized. The leading abnormalities include iron deficiency anemia (IDA) and megaloblastic anemia. IDA is in fact the most common clinical presentation in adults with CD. In a study of 135 children with IDA in Turkey, anti-endomysial antibodies were positive in 6 (4.4%). Prevalence of CD in adult patients with IDA has been reported to vary between 2.6-11.8%. ,, Carroccio et al., found the prevalence of CD in adults with IDA to be 5.8% and 20% in the refractory anemia group. Of 168 children with CD in Canada, anemia was a sign in 40% prior to diagnosis. In a study of 644 children with subclinical/silent CD from Italy, IDA was the most common extra-intestinal symptom. Fisgin et al., from Turkey have described 22 children who presented with hematological manifestations and were subsequently diagnosed to have CD. Anemia was the solitary manifestation in 19 (86%) patients and leukopenia in 2 (9%). Majority of the patients either had a microcytic hypochromic or dimorphic red cell morphology. A combined iron and folate deficiency is described to be the characteristic consequence of enteropathy of the proximal small bowel. Vitamin B12 deficiency is uncommon, since the enteropathy seldom extends to the ileum where there is little or no exposure to gluten. As the storage of folate is lower than vitamin B12, megaloblastic anemia due to folate deficiency occurs earlier than vitamin B12 in malabsorptive disorders. As biochemical markers were not estimated, the true prevalence of deficiency cannot be commented. Anemia was severe enough to require a red cell transfusion in nearly half. In developing countries like India, anemia is prevalent in two-thirds children due to nutritional deficiency and worm infestation. In such an epidemiological scenario, it is not feasible to screen all the children with anemia for CD. Instead, children refractory to a therapeutic trial of hematinics can be targeted for cost-effective screening. Sixteen percent patients had splenomegaly. Splenomegaly coexisting with microcytic hypochromic anemia and growth failure often made us suspect hemolytic anemia at the outset. With experience, we have now learnt to accept splenomegaly as one of the findings in CD akin to that observed in few cases with nutritional anemia. Children in our series were symptomatic for a median duration of three years. Diarrhea is an annoying symptom and parents are likely to seek early medical attention. Growth failure or anemia are subtle features and likely to escape attention resulting in a delayed presentation. In addition, the lack of awareness for 'hematological' manifestations of CD among health professionals contributes to delayed referral. Three children in our series had presented with bleeds secondary to coagulopathy. One case has been reported previously. Mitterstieler et al., reported four children with CD who presented with bleeding as the leading symptoms. Graham et al., reported two patients with acute onset of spontaneous bruising who were later confirmed to have CD. In a recent report, easy bruising was found in 11% patients. Prolonged PT has in fact been reported in up to 70% of untreated adults with CD; however, overt bleeds are very rare. Administration of parenteral vitamin K rapidly reverses the coagulopathy indicating the etiopathogenesis to be malabsorption of vitamin K.
Several conditions occur in association with CD. One condition of interest to hematologist is pulmonary hemosiderosis. Recurrent, acute episodes manifest as sudden pallor and pulmonary symptoms. An active search for CD should be made in all cases as clinical features of CD may be absent. GFD obviates the need for immunosuppressive therapy in majority. Growth failure is the hallmark of classical CD. Three-fourths of children in our study had a weight less than 80% and 41% had height below 90% of expected. It is believed that nearly 10% of children with "idiopathic" short stature have CD. On follow-up, there was improvement in anthropometry, though the figures were not statistically significant. Intrepretation of the growth parameters is less reliable in the face of relatively shorter duration of follow and high drop outs. To conclude, hematologists need to be aware of the extra-intestinal manifestations of CD. Serological tests for CD should be requested in children presenting with IDA that is refractory to hematinics or who have coexisting growth retardation. Whether duodenal biopsy can be avoided in select, overtly symptomatic, seropositive cases, needs deliberation. Prolonged duration of symptoms and a diagnosis at an older age indicates that awareness for CD needs to be broadened. Abatement of symptoms and improvement in growth parameters following GFD are gratifying for patient, family, and the physicians alike. 1. Hill ID, Dirks MH, Liptak GS, Colletti RB, Fasano A, Guandalini S, et al. Guideline for the diagnosis and treatment of celiac disease in children: Recommendations of the North American Society for Pediatric Gastroenterology, Hepatology and Nutrition. J Pediatr Gastroenterol Nutr 2005;40:1-19. 2. Meloni G, Dore A, Fanciulli G, Tanda F, Bottazzo GF. Subclinical coeliac disease in schoolchildren from northern Sardinia. Lancet 1999;353:37. 3. Bingley PJ, Williams AJ, Norcross AJ, Unsworth DJ, Lock RJ, Ness AR, et al. Undiagnosed coeliac disease at age seven: Population based prospective birth cohort study. BMJ 2004;328:322-3. 4. Maki M, Mustalahti K, Kokkonen J, Kulmala P, Haapalahti M, Karttunen T, et al. Prevalence of celiac disease among children in Finland. N Engl J Med 2003;348:2517-24. 5. Van Heel DA, West J. Recent advances in coeliac disease. Gut 2006;55:1037-46. 6. Westerberg DP, Gill JM, Dave B, DiPrinzio MJ, Quisel A, Foy A. New strategies for diagnosis and management of celiac disease. J Am Osteopath Assoc 2006;106:145-51. 7. Bhatnagar S, Bhan MK. Serological diagnosis of celiac disease. Indian J Pediatr 1999;66:S26-31. 8. Bhatnagar S, Gupta SD, Mathur M, Phillips AD, Kumar R, Knutton S, et al. Celiac disease with mild to moderate histologic changes is a common cause of chronic diarrhea in Indian children. J Pediatr Gastroenterol Nutr 2005;41:204-9. 9. Patwari AK, Anand VK, Kapur G, Narayan S. Clinical and nutritional profile of children with celiac disease. Indian Pediatr 2003;40:337-42. 10. Mohindra S, Yachha SK, Srivastava A, Krishnani N, Aggarwal R, Ghoshal UC, et al. Coeliac disease in Indian children: Assessment of clinical, nutritional and pathologic characteristics. J Health Popul Nutr 2001;19:204-8. 11. Poddar U, Thapa BR, Nain CK, Prasad A, Singh K. Celiac disease in India: Are they true cases of celiac disease? J Pediatr Gastroenterol Nutr 2002;35:508-12. 12. Pooni PA, Chhina RS, Jaina BK, Singh D, Gautam A. Clinical and anthropometric profile of children with celiac disease in Punjab (North India). J Trop Pediatr 2006;52:30-3. 13. Kalhan S, Joseph P, Sharma S, Dubey S, Dudani S, Dixit M. Comparative study of histopathological Marsh grading with clinical and serological parameters in celiac iceberg of north India. Indian J Pathol Microbiol 2011;54:279-83. 14. Fasano A. Celiac disease-how to handle a clinical chameleon. N Engl J Med 2003;348:2568-70. 15. The working group of the European Society of Paediatric Gastroenterology and Nutrition. Revised criteria for diagnosis of celiac disease. Arch Dis Child 1990;65:909-11. 16. Farrell RJ, Kelly CP. Celiac sprue. N Engl J Med 2002;346:180-8. 17. Dieterich W, Ehnis T, Bauer M, Donner P, Volta U, Riecken EO, et al. Identification of tissue transglutaminase as the autoantigen of coeliac disease. Nat Med 1997;3:797-801. 18. Scoglio R, Di Pasquale G, Pagano G, Lucanto MC, Magazzu G, Sferlazzas C. Is intestinal biopsy always needed for diagnosis of celiac disease? Am J Gastroenterol 2003;98:1325-31. 19. Alfonsi, P, Iannuzzi V. Is intestinal biopsy always needed for diagnosis of celiac disease? Am J Gastroenterol 2004;99:963. 20. Murdock AM, Johnston SD. Diagnostic criteria for coeliac disease: Time for change? Eur J Gastroenterol Hepatol 2005;17:41-3. 21. Ribes-Koninckx C, Mearin M, Korponay-Szabó I, Shamir R, Husby S, Ventura A, et al. The ESPGHAN Working Group on Coeliac Disease Diagnosis. Coeliac disease diagnosis: Espghan 1990 Criteria or need for a change? Results of a questionnaire. J Pediatr Gastroenterol Nutr 2011 Jun 28. [Epub ahead of print]. 22. Mubarak A, Wolters VM, Gerritsen SA, Gmelig-Meyling FH, Ten Kate FJ, Houwen RH. A biopsy is not always necessary to diagnose celiac disease. J Pediatr Gastroenterol Nutr 2011;52:554-7. 23. Clouzeau-Girard H, Rebouissoux L, Taupin JL, Le Bail B, Kalach N, Michaud L, et al. HLA-DQ genotyping combined with serological markers for the diagnosis of celiac disease: Is intestinal biopsy still mandatory? J Pediatr Gastroenterol Nutr 2011;52:729-33. 24. Evans KE, Sanders DS. What is the use of biopsy and antibodies in celiac disease diagnosis? J Intern Med 2011;269:572-81. 25. Kalayci AG, Kanber Y, Birinci A, Yildiz L, Albayrak D. The prevalence of coeliac disease as detected by screening in children with iron deficiency anaemia. Acta Paediatr 2005;94:678-81. 26. Carroccio A, Iannitto E, Cavataio F, Montalto G, Tumminello M, Campagna P, et al. Sideropenic anemia and celiac disease: One study, two points of view. Dig Dis Sci 1998;43:673-8. 27. McIntyre AS, Long RG. 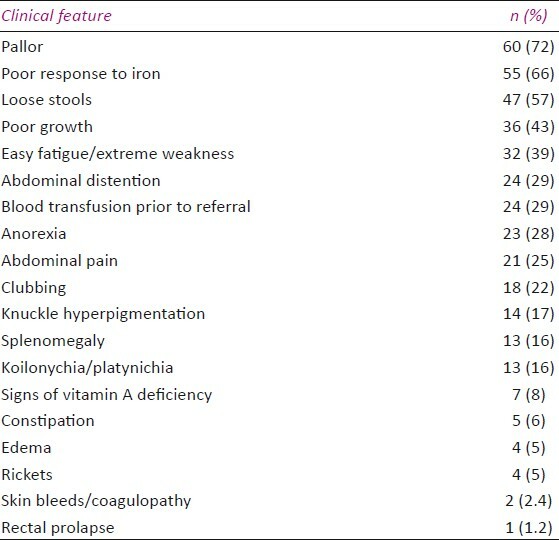 Prospective survey of investigations in outpatients referred with iron deficiency anaemia. Gut 1993;34:1102-7. 28. Ackerman Z, Eliakim R, Stalnikowicz R, Rachmilewitz D. Role of small bowel biopsy in the endoscopic evaluation of adults with iron deficiency anemia. Am J Gastroenterol 1996;91:2099-102. 29. Rashid M, Cranney A, Zarkadas M, Graham ID, Switzer C, Case S, et al. Celiac disease: Evaluation of the diagnosis and dietary compliance in Canadian children. Pediatrics 2005;116:e754-9. 30. Bottaro G, Cataldo N, Rotolo N, Spina M, Corazza GR. The clinical pattern of subclinical/silent celiac disease: An analysis on 1026 consecutive cases. Am J Gastroenterol 1999;94:691-6. 31. Fisgin T, Yarali N, Duru F, Usta B, Kara A. Hematologic manifestation of childhood celiac disease. Acta Haematol 2004;111:211-4. 32. O'Grady JG, Stevens FM, Harding B, O'Gorman TA, McNicholl B, McCarthy CF. Hyposplenism and gluten-sensitive enteropathy. Natural history, incidence, and relationship to diet and small bowel morphology. Gastroenterology 1984;87:1326-31. 33. Vazquez H, Martinez C, Xavier L, Mazure R, Boerr L, Bai J. Hyposplenism in celiac disease. Role of a gluten-free diet. Acta Gastroenterol Latinoam 1991;21:17-21. 34. Martin U. Glutein sensitive enteropathy. In: Behrman RE, Kliegman RM, Jenson HB, editors. Nelson Textbook of Pediatrics.17 th ed. Philadelphia, PA: Saunders; 2004. p. 1264-5. 35. Hamilton JR, Lynch MJ, Reilly BJ. Active coeliac disease in childhood: Clinical and laboratory findings of forty-two cases. Q J Med 1969;38:135-58. 36. Poddar U, Thapa BR, Nain CK, Prasad A, Singh K. Celiac disease in India: Are they true cases of celiac disease? J Pediatr Gastroenterol Nutr 2002;35:508-12. 37. Thapa BR. Celiac disease in India. Indian J Pediatr 1999;66:S16-20. 38. Puri AS, Garg S, Monga R, Tyagi P, Saraswat MK. Spectrum of atypical celiac disease in North Indian children. Indian Pediatr 2004;41:822-7. 39. Rath S, Bansal D, Marwaha RK. Celiac disease presenting with intracranial bleed and ecchymoses. J Pediatr Hematol Oncol 2003;25:589-91. 40. Mitterstieler G, Zieglauer H. Vitamin K deficiency bleeding as a leading symptom in celiac disease. Padiatr Padol 1978;13:175-82. 41. Graham DR, Bellingham AJ, Alstead E, Krasner N, Martindale J. Coeliac disease presenting as acute bleeding disorders. Postgrad Med J 1982;58:178-9. 42. Collin P, Reunala T, Pukkala E, Laippala P, Keyriläinen O, Pasternack A. Coeliac disease-associated disorders and survival. Gut 1994;35:1215-8. 43. Reading R, Watson JG, Platt JW, Bird AG. Pulmonary haemosiderosis and gluten. Arch Dis Child 1987;62:513-5. 44. Groll A, Candy DC, Preece MA, Tanner JM, Harries JT. Short stature as the primary manifestation of celiac disease. Lancet 1980;22:1097-9. 45. Stenhammar C, Fallstrom SP, Jansson G, Lindberg T. Celiac disease in children of short stature without gastrointestinal symptoms. Eur J Pediatr 1986;145:185-9.